Hi all. I'm new to the forum. Just bought my third ball python. A beautiful Albino Lavender. He's one and a half year old. It's my first one bought directly from a breeder. She told me that the snake was eating live and f/t but the last month he was eating only live because it was faster when you have a lot of snake. First day she said to give him a live pup rat. Even in his new house cause she skipped a week to be sure that he will be hungry. Ten second after he ate the rat. Now we are one week later. I know that he can eat a bigger rat. But the question is ... is it better to give him a live prey cause it will be bigger ? Or because it's a new one week house ? Or I try the bigger f/t ? I got some f/t pup too but I think it's to small for him. 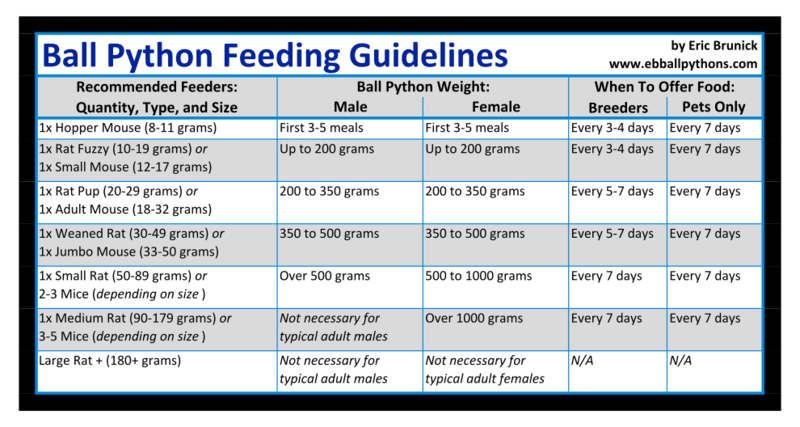 You should be feeding based on your snakes weight. Also, welcome to the forum. Post some pics of your new little guy when you get a chance! Last edited by Jmarshall; 04-11-2019 at 12:55 AM. I was told my first one ate f/t or live. Was giving it f/t cuz easier to store and less stinky smell. And she ate every time. Then came the other 2. Picky as heck. Will not even go around a f/t. Tried weekly for 6-7 times. They just run from it. It's almost like they could tell it was frozen, or something. l Finally just gave up, and feed them all live now. And they all ate every time. I guess they just prefer fresh over frozen. Last edited by Samurai; 04-11-2019 at 10:33 AM. Personally, I'd have worked a little harder to persuade the "other 2" to take f/t, because as they grow larger & need larger prey, your pets run the risk of serious injuries & even death when they get chewed by the rats they're trying to kill. Wouldn't want to look forward to that, personally -scars may be natural on wild snakes, who have to kill their own food to survive, but it's best avoided on our beautiful pets for the sake not only of their beauty but their health. Rats CAN kill snakes, or injure them enough to make they wish they were dead: ask any exotic animal vet who has treated snakes for some time...they see eye losses, mouth injuries that prevent the snake from eating, and snakes chewed to the bone from live rats. Not all pets survive these injuries: either directly or because euthanasia is the best option, or they later die from the infections.Vet bills can be hard on your budget, & making time for medical care isn't the most fun either. When snakes like BPs are raised on live feeders, they seem to get pretty good at making kills, but sooner or later, all it takes is a little slip up...rats are intelligent animals (they actually make great pets too) & they object to being dinner. They have serious teeth that can chew thru bricks & pipes...you really don't want them chewing through your pet, do you? Many members here find a hairdryer (blow dryer) to be very helpful in warming the head of the f/t rodents so their BPs respond to them as if alive. I hope you'll consider this? Last edited by Bogertophis; 04-11-2019 at 12:12 PM. the vet and then do home care for it to heal from injuries. It's really just a matter of time. Vet bills can really cut into your budget too. Last edited by Bogertophis; 04-11-2019 at 12:27 PM. I've been feeding live rat pups to my ball since I got him. Haven't had an issue yet (knocks on wood). I've been considering switching to either FT or fresh kill (they do that all my local reptile store). But im worried of having this issue since it's used to live prey. I don't want to spook the snake and have it go in a strike. I also worry about a larger rat getting a hold of my snake. The rat pups are relatively small and I keep an eye in the tank as it strikes. If his mouth gets too close to my snake, I stick a screwdriver in there to make space. That's what I do with my female. When I put a rat in I'm watching till she eat it. If he come to close I remove it.